When the University of North Carolina fielded its first varsity men's team in 1911, nobody could have imagined the mark its program would make on the history of college basketball. University of North Carolina Basketball chronicles the long and distinguished history of the Tar Heels, including the school's numerous Southern Conference and Atlantic Coast Conference titles and its national championship teams. North Carolina has produced arguably the finest group of basketball minds and talent the sport has ever known. The list reads like a "Who's Who" of influential figures in college and professional basketball history, including Jack Cobb, George "The Blind Bomber" Glamack, "Bones" McKinney, Frank McGuire, Lennie Rosenbluth, Dean Smith, Doug Moe, Donnie Walsh, Larry Brown, Billy Cunningham, Charles Scott, George Karl, Mitch Kupchak, Phil Ford, James Worthy, Michael Jordan, Rasheed Wallace, Antawn Jamison, Vince Carter, and Roy Williams. 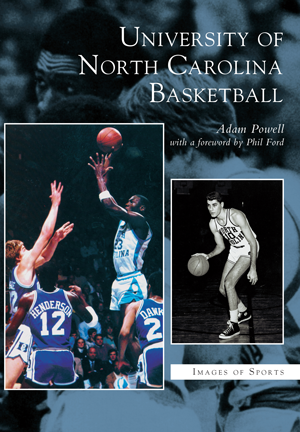 Author Adam Powell remembers running around with a Nerf basketball pretending to be Sam Perkins at the age of four, and he has followed the Tar Heels ever since. A 2001 graduate of UNC–Chapel Hill, Adam's journalism talents are currently featured in the Tar Heel Report (www.carolinablue.com).